We motored 20 miles south from Tahsis, down another beautiful, steep sided, forested channel. stopping to investigate several small coves along the way to Friendly Cove. We're starting to see more and more people, cruisers, kayak campers and many sport fisherman fishing for salmon and halibut. Friendly Cove is located just inside Nootka Point at the mouth of Nootka Sound where there are a number of interesting features: Rugged scenery, beautiful bay, public dock to tie up, Incredible beach, tide rental cabins and grassy campground, clear warm lake to swim in, stunning modern native carvings and Nootka Point Light Station. A calm and easy passage from Rugged Point to Queen Cove, not quite enough wind to bother with the mainsail. There were several boats there. One was a converted trawler/seiner used as a base for sport fishermen who fish from small boats at the mouth of Esperanza Inlet Our friends, John & Diane from Anomandra's Blues joined us. Just a few miles away, the pretty & rocky Nuchalitz Bay and park was a lovely and peaceful anchorage. During the afternoon, we explored in the dinghy. The evening's entertainment was cocoa and Upwords aboard Anomandra's Blues with John and Diane. Tahsis is another former mill town, reinventing itself, but it was still pretty quiet. Under sunny skies, we motored further into Kyuquot Sound and anchored for the night in an interior cove of Dixie Cove. Wonder of wonders - the water was warm enough for swimming! What a treat. The cove is mostly surrounded by high stone cliffs, and very pretty. But it's hard to take any photos that do it justice. We had the place to ourselves, until the sailboat Narnia from Seattle arrived in the evening. We got acquainted and were to see them again later on as we traveled down the coast. Another sunny day and a short trip to Rugged Point Provincial Park at the southern lip of Kyuquot Sound. The locals at Kyuquot Village especially recommended it. There's a lovely anchorage on the inside and a short trail to beautiful beaches on the outside. Paradise. On glassy calm waters and sunny skies we motored southward close to the steep shore. There are huge logs tossed high up by winter storms, and sea caves. One especially pretty sight is a waterfall cascading over a cave entrance. After meandering around, we arrived in Walter Cove, which has a native settlement of 200+ people and several fishing lodges. We stopped in Java the Hutt to request places for dinner that night, and was surprised to find the proprietor to be a Roosevelt High School classmate of Kathi's, the irrepressible Eric Gorbman. Eric's very outgoing and it was really fun to share news about various other classmates we've been in touch with. Eric runs the Kyuquot Inn with rooms and cabins and the restaurant. It's a gathering point for people from the village and passengers from the Uchuck III, the weekly ship. He also has a shop, lots of tools and boats. So we brought over our troublesome outboard so Bill could set it up on a rack and diagnosis its problems. It was the afternoon's entertainment for Bill and Eric's helpful friends Derek and Robert. It was easy to get apart and diagnosis (oil leak), but much more difficult to put back together. Normally, Thursday afternoon's main entertainment is watching the unloading of the Uchuck, but we busy with the outboard. The Uchuck was tied to the public wharf near us. So later the Mate, Spencer, gave us a tour of the boat. It's a wonderful former minesweeper modified for it's current purpose. It's just completed 50 years service along various roadless sounds along the west coast of Vancouver Island. 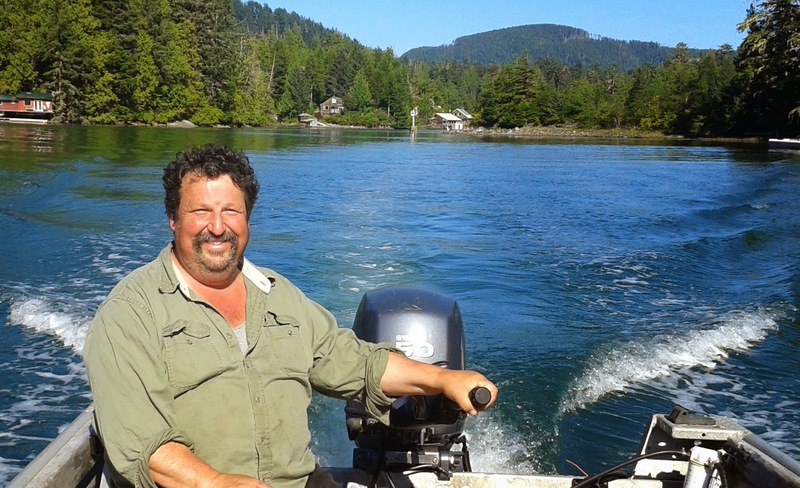 Eric took us on a tour of some neaby islands. First, we went to the recently abandoned native village at Barter Cove. (last person left in the 1960s, so the buildings are relatively intact. Then we went over to Spring Island, visited Eric's friend at a fabulous kayak base camp. There's a very good trail across the island to the site of a former loran station. It is the most stunning setting of rocky coves and beaches. The sun was hot and the breeze was cool. It was a great afternoon running around on Eric's fast fizz-boat!. He knows where all the rocks are. This was a beautiful anchorage, although too shallow to stay in the main cove. So we rafted with Anomandra's Blues in the entrance in calm conditions overnight. We found a beautiful anchorage in Bunsby Islands and stayed two nights. Unfortunately,since our dinghy outboard was sketchy we only explored our immediate cove by rowing. However, the first evening just as we sat down for dinner in the cockpit, a bear started turning over rocks in search of his dinner on the beach a few hundred feet from the boat. So, while our dinner was cooling in the waning daylight, Bill was able to shoot a lot of "film". There was also a noisy otter about. They float on their backs while loudly cracking shells for their meal. The second day we were joined by our friends John and Diane aboard Anomandra's Blues. 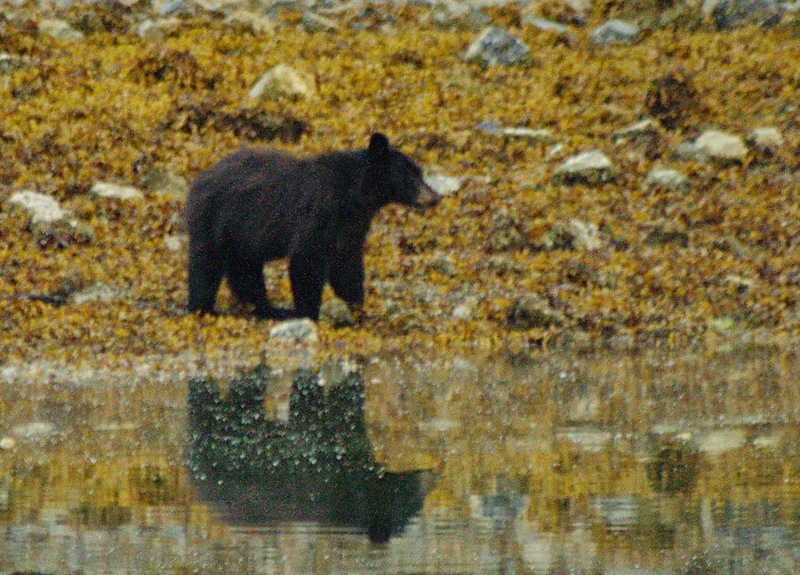 A bear appeared on the opposite side of the cove too. Instead of Winter Harbour, we motored up to the real town of Port Alice, really Rumble Beach, where there's a great little marina. The town of Port Alice is a lovely, tidy, peaceful town with a good grocery store and restaurant surrounded by beautiful scenery. We were able to get showers at a nearby campground, although, the ladies' wasnt' working too well and after I ran out of loonies, I had to call the owner, Ozzy, who rode over in his little cart to resolve the problem. He was disappointed to see I was already dressed again when he arrived. He was a kick. The next night we anchored in beautiful Julian Cove and were joined by our new friends John and Diane on the Anomandra. And wouldn't you know it? He's a poet. Really, published and everything. Sandy, the fuel dock attendant, was fun to talk to. He was retired from PACCAR and had also traveled to Tasmania, so we had a lot in common. We motored down to beautiful Klaskish Inlet for the night with Daphne Isle. A short weather window of NW winds and clear skies came along on Wednesday morning. It looked like it would be at least another week before NW winds would appear again so we decided to jump at this opportunity. As we motored south out of Louscoone Inlet, Bill spotted some big whale spouts backlit by the sun along the shore. Good. Unfortunately, soon after that, there were 2 big bangs and a log slid out behind the boat. Bad. But the prop continued to turn smoothly, so we figured no harm done. Bill usually keeps a keen eye ahead, but we have the inflated dinghy on the bow and it really interferes with vision of the surface directly ahead of the boat. It's like having a dinghy strapped to the hood of your car. Doh! We continued on. Soon a pair of humpback whales surfaced perhaps a hundred yards ahead of the boat, passing right to left toward shore. Half an hour later, a solitary orca appeared off a few hundred yards off to port. In the meantime, a pair of brown albratross decided to pay us a visit, circling around the boat for an hour or so. One of them grew tired and touched down on the water. That was the last we saw of them. They are known to range across the Pacific from Midway to Moresby Island. We consider ourselves lucky to see them this close to land. About two hours after we saw the orca, there was a big thud, not sharp sounding, but it nearly stopped that boat and there was a lot of turbulence in the water. We think we hit a sleeping whale, but we saw nothing.... Yikes! It took a while for the wind to fill in and we had protection from the swells and posi-current for a while past the south tip of Graham Island (Cape St James), so it gave us a chance to get our sea legs while making good progress. The wind gradually built up into the high teens and we were sailing under nearly cloudless blue skies. This is as close to trade wind sailing as we will ever get in this part of the world and it was fantastic. This was our first overnight passage in almost two years. We did 4-hour watches starting at 2000 (8pm), Kathi, 0000 Bill, 0400 Kathi, 0800 Bill. It's a tiring routine. Eventually, we had big seas off the quarter and the wind topped out at 26kts with Jarana under a single reefed main and partly furled jib. We slid down the waves to the roar of our own surf. It was a blast, what ocean sailors live for. Except it's much colder than the trades, so we were bundled up. Our top speed was 12.6 kts! Yeee Haaa! There was no moon and soon clouds covered the stars. It was almost surreal sailing along in the dark with the whitecaps and boats bow wave phosphorescing brilliantly under the moonless sky. Fortunately, there is little ship traffic and not so many logs floating around. Like we saw crossing Hecate Strait, there were thousands of tiny sail jellyfish, blue on the water surface with tiny curved clear sails. Some came aboard with the spray. We slid past the SW side of Triangle Island; it's silhouette was just visible in the dark. We gybed back onto starboard to avoid Sartine Island which loomed ahead. South of Scott Islands (west of Cape Scott), there were a few active commercial fishing boats but they were well lit and visible on AIS. As the glow of the morning twilight began the wind began to taper off and by sunrise we were motoring for the last leg of the trip. After 178 nm, we arrived 1130 on Thursday, at Kains Island light, motoring under light winds and calm seas, and anchored in this calm inlet to rest and clean up before going to Winter Harbour for fuel and whatever else looks good. Maybe chat up some thirsty fishermen for a fish..... Sometimes it works. Damage report: hardly anything The house batteries are getting pretty tired, they're 5 years old. We use a lot of power at night underway for instruments, plotters and lights, so it was the first big test of the batteries for a while and they showed their age. We're really glad the gooseneck broke in calm Victoria Harbour in midday, and not out on the bounding main at night. Snafus: In trying some fancy footwork furling the jib with the pole still attached, we ended up with the topping lift wrapped up in the furler and with Jibsheet Macrame around bow cleats, through chocks and under the dinghy. It was a chore to undo, in the cramped deck space forward of the dinghy. Wed, July 16th - Sac Bay is a bay within a bay (De La Beche), surrounded by rocky hills with some chattering streams and waterfall. We were all by ourselves except for the eagles and seals. Weather was calm and sunny, good for dinghy exploring. And it was warm and private enough we could take showers on deck. Yay! We stayed 2 nights. Overnight the wind came up on the west side of the island, and funneled though to our side. The wind was moderate, but was punctuated by big 30 knot gusts blasting through the anchorage and it rained harder than any place we've been on this trip so far. The boat was secure, but kind of noisy. When we left the next morning, we pulled out just the little jib and squirted out into open water like a watermelon seed. Of course, that only lasted a little while, and we were motoring again. Sat. July 19th Section Bay to Bag Harbour. Under sunny skies we motored around to Bag Harbour at the south end of Dolomite Narrows. If you check our location on the chart, we went around the long way (east around Burnaby Island). Dolomite Narrows, is very shallow and winding, so it's good to explore by dinghy. Bag Harbour is big and round with a flat muddy bottom (Anchors love it). And finally, we actually had human company. It was a powerboat from Bellingham. We chatted a bit. They left next day and were replace by kayakers, but we were never close enough to speak....That night Bill cooked a lamb roast on the BBQ. It was really good and made 2 dinners. There were lots of deer grazing on the shoreline here and even more along the shore in Dolomite Narrows. S'Gang Gwaii is a very special Haida village on a small island at the very southernmost end of the Haida Gwaii archipelago. It's a world heritage site. The totems are kept free of the moss and lichen covering most of the other ones we've seen. There were lots of other people there, some by kayaks, others in big RIBS (fast launches) and a couple skippered sailboats that take passengers. It was the most people we'd seen and heard since Prince Rupert. The island is very rocky all around, but there is a great cove on the north side with an available mooring. So we took that. At the other villages, we have been the only visitors, so followed the watchman/guide around alone. Today we were with several other people, mostly from BC. So that was different for us. Tonight is our last night in Haida Gwaii. Bill found us a great anchorage in Louscoone Inlet, sunny, calm quiet and alone. (Actually, one of the skippered sailboats is in the next cove, but we can't see them.... We didn't have a fancy dinner as we're preparing for our ocean passage back to Vancouver Island. This involves taking the outboard off the dinghy and stowing the dinghy on deck. Prepping the main for hoisting and stowing all the loose stuff in the cabin so it doesn't fly around. Also I try to prep easy comfort food for the passage. I hope we can remember how to sail if we get any wind. It's been a long time since we've been out on the ocean standing watches. The next morning, July 14th, we motored south through scenic Dana Pass to Tanu Village where we were welcomed by watchmen Walter and Mary and their little granddaughter Raven. As we dinghied to shore, a family of orcas passed between us and Jarana at anchor! They were so close, it was really exciting. We were to see a lot more of those whales when we left. Walter gave us a great tour of the many remaining fallen longhouses and a great explanation of village life and the mortuary poles. I wish I'd take photos of Mary and Walter, they were terrific. Anyway, concerned about swing room, we dug out the stern tie line and Bill dinghied towards shore trailing it from the boat. It doesn't quite reach, so I back a bit. Hmmm... Bill couldn't get close enough to tie to anything. I guess we were farther than it looked. So he went to the side of the bay and discovered it too, was much farther than appeared. So we concluded no need to tie. July 15th we motored out to Windy Bay in glassy calm. Windy Bay is a tiny rock strewn cove and river mouth. Fortunately there is a good mooring to use, so we didn't have to solve the anchor-swingroom-depth problem. Carla, her son Anthony and toddler daughter Shyla welcomed us and gave us a tour. Most of the charting is pretty good, although often depths are understated, ie real depths are greater than we expect and sometimes not practical for us. Most anchorages have had nice sticky mud bottoms that the anchor digs right into. But sometimes, when backing down to set the anchor we just bumpily drag it across a rocky bottom. 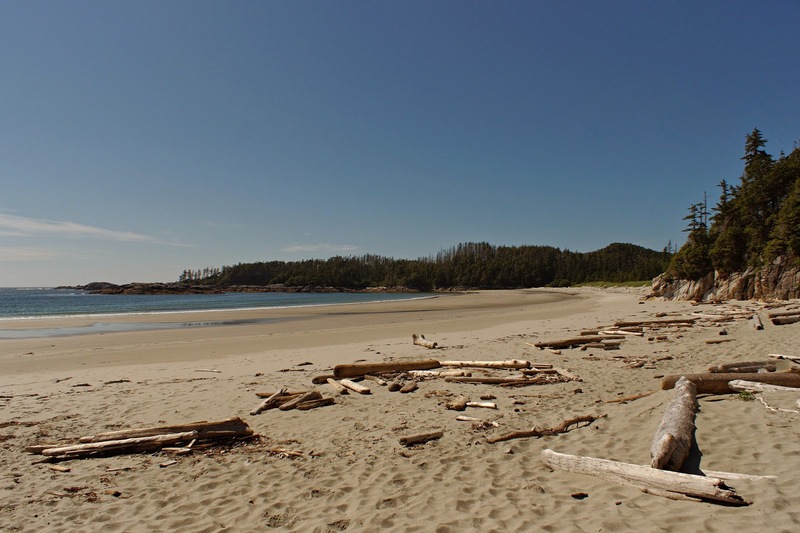 Find an online map of Haida Gwaii to see the location of the villages. If you don't see the anchorages on the map, try searching for the lat/longs given in Google Earth or Open CPN. 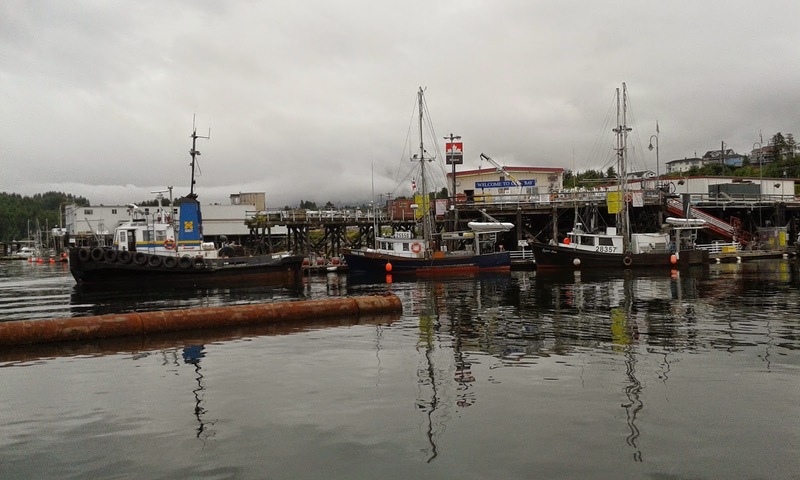 Early on 12 July we left Queen Charlotte City (QCC) for Sandspit Marina to fuel up. The tide was very low (more than 20ft from the high), so the small marina was a forest of tall pilings. Under calm & sunny skies we motored (again) out over the bar. Our first stop was the former Haida village known as Skedans. As we dinghied in, a family of orcas passed between our dinghy and Jarana. 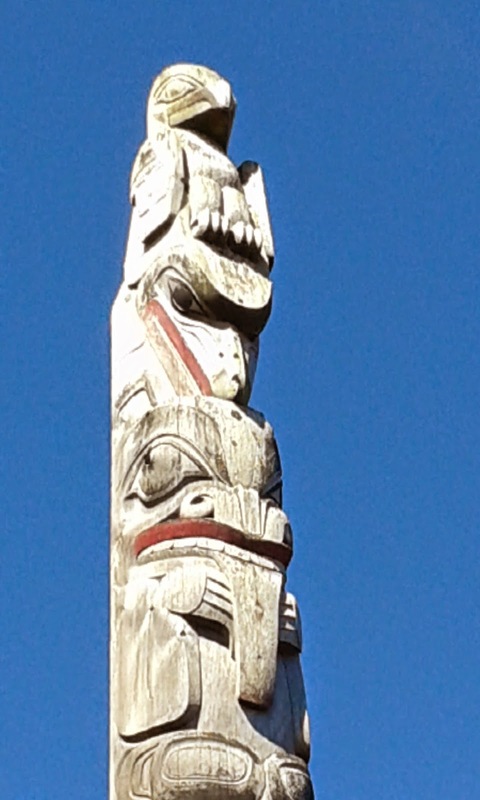 There are numerous totem and morturary poles. (great photos to post later) Each village site has watchmen onsite. When we came ashore, a young couple were baiting large hooks with salmon meat to catch halibut. Nicholas gave us a great tour with much historical explanation. 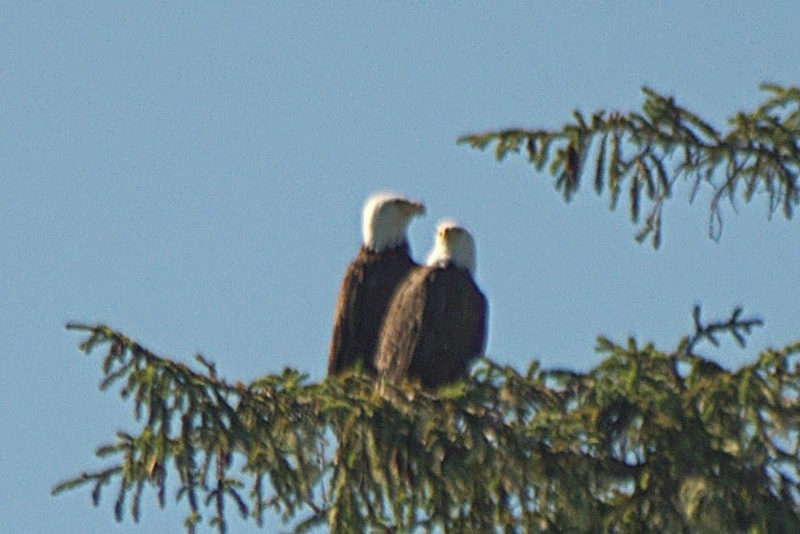 Historically, the two main Haida clans are Eagle and Raven. Nicholas' ancestors were from Skedans, and he knew his grandparents. Many in his greatgrandparents' generation vacated the island villages after a devastating smallpox epidemic in the early 1900s. Most survivors were taken in by the Skidegate village. Many children were sent to the notorious boarding schools far away to be stripped of their native culture and language. The Haida lived in longhouses. Interestingly, it was traditional for each clan to assemble the houses of the other clan, and they had to be raised in one day. They used logs for posts and beams, and planks for walls, floors and roofs. There are many remaining large poles and beams, but they are swathed in moss, so it's difficult to see the carvings. There are many remaining mortuary poles, tall and thick with cutouts in the top for boxes of remains, all long gone now. Many artifacts and poles have been removed to museums far and wide. Some remains are being repatriated. 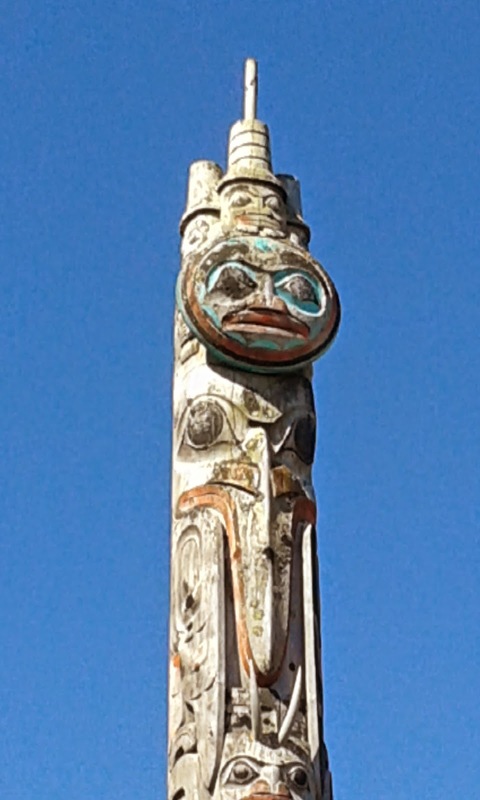 The Haida Nation posts watchmen at each village site to protect and explain the remaining artifacts. They are very interesting and give us a warm welcome when we arrive. There were a couple large sailboats that host tourists to visit the area standing off Skedans when we arrived. The watchman sites usually limit the number of concurrent visitors to 12, but so far, it's just been us. After our visit, we motored a few miles to the Limestone Islands to anchor overnight. We saw a couple kayaks along the shore and a converted fishing boat anchored for the night as well. It was the last time, so far that we've shared an anchorage. Limestone Bay has a lovely long, sandy beach. So the next morning we dinghied ashore for a walk and some exploring. There was a vacant kayak camp with tent platforms, kitchen benches and other conveniences. 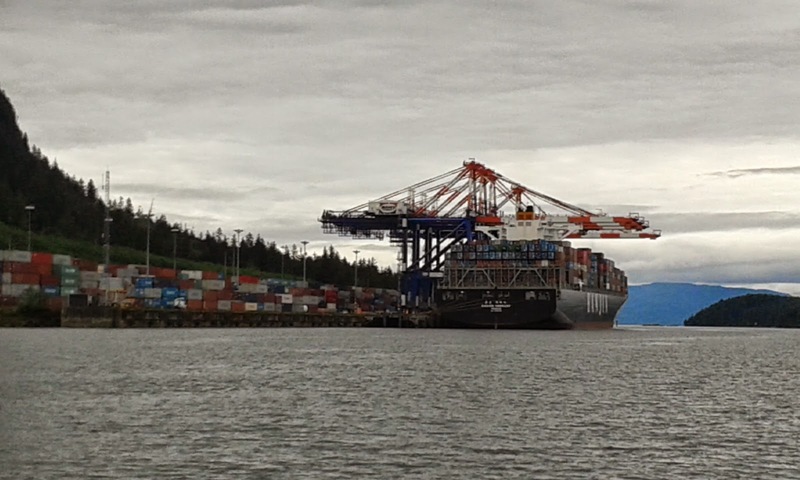 On Tuesday, we left the busy port of Prince Rupert and motored (again) out towards a jumping off point. After a long afternoon and a false attempt at Larson Bay, a recommended stop, we picked our way through a rocky path to Griffin Bay. Loon song greeted us and it was a good anchorage among beautiful, peaceful and solitary scenery overnight. Wednesday morning we set off across Hecate Strait. We hoisted the main and anticipated our first sail in weeks. Moderate northwesterly winds were forecast,.... but Noooo. We motor sailed sometimes, when there was enough breeze for that. Before long, we could see the mountains of Haida Gwaii revealed through the clouds in the west. It was an easy approach. Skidegate Inlet divides the two main islands, Graham and Moresby, with low forested mountains on either side. The anchorage in front of Queen Charlotte City (QCC pop ~700) was excellent. The following morning we found a berth in the municipal marina at the foot of the ramp among the sport and commercial fishing boats. The weather was (and continues to be) sunny - Praise Be! It's breezy of the strait in the afternoon, but excellent biking weather. Since most of our visit will be in the Gwaii Haanas National Park, we attended a required orientation at the wonderful Haida Gwaii Museum in Skidegate. It was a great bike ride from QCC to Skidegate on a good road, light traffic, light wind and SUNSHINE!!! and more is forecast. As an additional bonus, we met two other cruiser boats, Linger Longer from Shilshole D-dock, and Saracen from Vancouver. We'd seen Saracen at several other spots, so it was about time we got acquainted. We hope to see more of both of them later in the park. Moving on: the plan is to get fuel at Sandspit and make our first stop at Skedans, a former Haida village site. We spent 3 nights in Prince Rupert. It's a great town, everybody has been very friendly and super polite. There are several good, not fancy restaurants and great provisioning. The laundromat is a long walk, but we needed a lot of walking after being confined to the boat for several days before we arrived. PR is a fairly small town, but a big port, with lots of big ships calling at a coal terminal, a grain terminal, a container terminal, a cruise ship dock. There were a couple log ships anchored upstream, but we never saw the log terminal. The Museum of Northern British Columbia is terrific, with a good history of the First Nations Bands and Clans before the Europeans took over. Commercial and sport fishing are big here and we arrived during the coho opener. From our berth at PRRYC we had a view of the constant activity at the fuel dock. There were fishing boats, yachts, pilot boat, big excursion schooner Maple Leaf, tugs, and other work boats. The days are long, sunrise is early and sunset is after 10pm. The weather is mostly overcast, but much warmer than out in the islands. 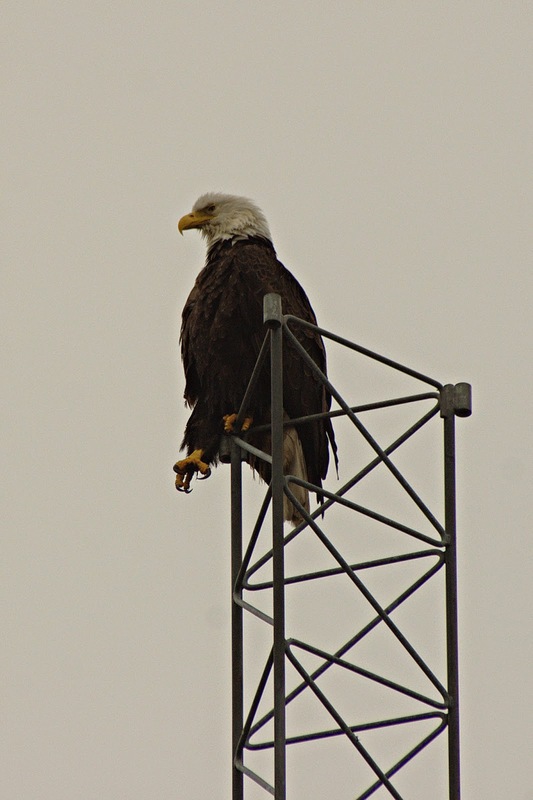 And the eagles are everywhere around the town. Strangely, we see very few sea gulls around the fishing boats. Of course, there's compensation for the rain: waterfalls. We haven't met many other cruisers, so for "entertainment" Kathi listens to the weather forecasts. However, for several days, we were so isolated up inlets and behind mountains, we didn't have vhf radio reception. However, we could still get HF radio and get weather and email that way. One (rainy) night, we anchored in jellyfish soup. Reluctantly, we left paradise at Pruth Bay. It would have been really nice to stay another day, but weather and time said we should move on. The day was calm, sunny and hot as we motored up Fitzhugh Sound 47 mi to Ocean Falls, an abandoned mill town at the end of Cousins Inlet. It's a beautiful if sad setting sprinkled with wildflowers around abandoned and collapsing buildings, rusting vehicles a dam and roaring spillway. There are a few remaining local residences, a small hotel & cafe and a really good public dock with several boats. The SYC burgee left by our friends on Schatzi and Perseverence still hangs in the dock shack. The fishing nearby must be good, from the great blackmouth salmon being fileted at the docks fish cleaning station. A strong inflow wind blew all afternoon as we explored the area. The inlet is girded by tall stony mountains and the trickle of waterfalls here and there. June 24th. Fitz Hugh Sound from Fury Cove to Pruth Bay. Sunny and light north breeze. Fitz Hugh Sound is surrounded by majestic mountainous islands on either side, with some large waterfalls. Sunshine and blue skies are pretty, but it's a mighty cold north wind for Bill back at the wheel. After lots of work, Bill got the dinghy inflated and the outboard motor running so we could get ashore. The institute allows visiting yachties to use their dinghy dock and walk through their large property to the fabulous beach on the other side of an isthmus. The sun was shining and small waves lapped the long crescent beach. It's a stunning setting. 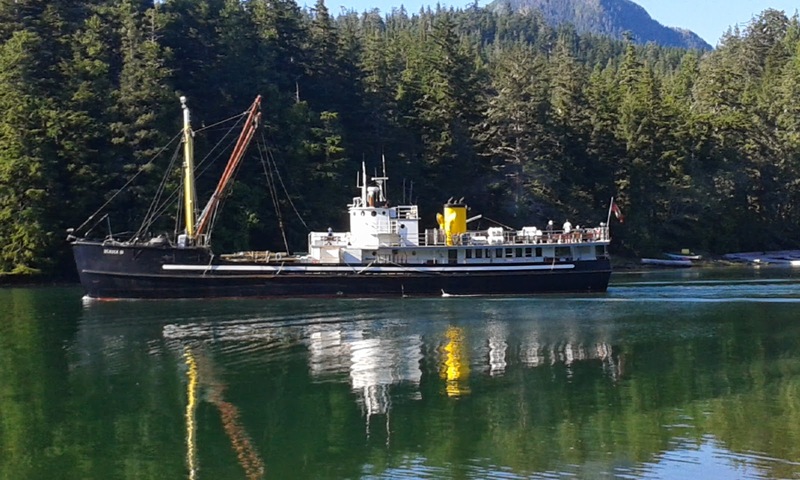 Pruth Bay is at the north end of Calvert Island. 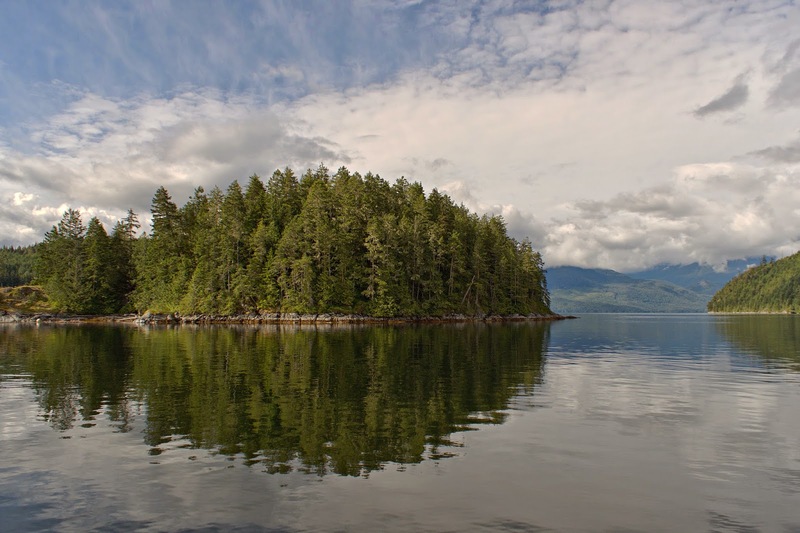 A former upscale fishing resort has been converted into the Hakai Institute for environmental research. Only one other cruising boat was anchored when we arrived. There are just a few researchers and grad students around outdoors, so it's peaceful. Even without leaks, in damp weather condensation accumulates inside the boat. So today while motoring north, we disassembled the bedding in the fwd cabin and put a heater and a fan on to dry it out. Up until now, we've mostly had the wind from the south or SE behind us. But the northerlies seem to be getting established, so it'll be on the nose more often going forward. June 17th Nanaimo to Blind Bay (BC Mainland, sort of) We had our 2nd real sail of the trip reaching on a SE breeze. There were several boats in the anchorage, some of which we were to see again later. 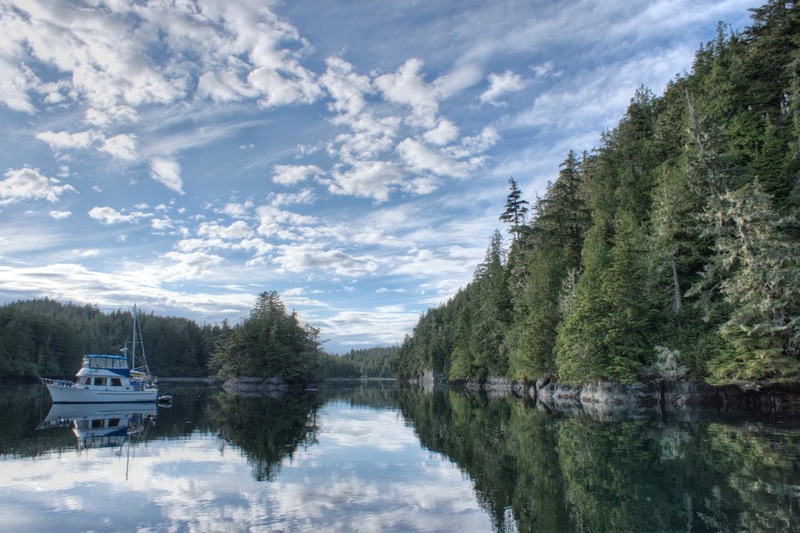 June 19th, overcast S breeze with 30-40 knots forecast for Johnstone Strait. So we took the long way, the inside via Yaculta and Dent Rapids all the way to Port Harvey (77mi!) Some porpoises swam along with us in Johnstone Strait. The strong winds never materialized. The last few hours were in the rain and we got cold and wet. There were a few other boats farther in the bay from us. June 20th, pt sunny. light N breeze. We watched some orcas along the way from Port Harvey to Mound Island. We anchored in a beautiful calm bay behind Mound Island (opposite the renovated longhouse at New Vancouver. We discovered a leak around the mast-deck "seal", so the forward head needed drying out. We were alone until one powerboat anchored farther in the bay. June 21st Motoring to Port McNeill partly sunny and calm. We saw several humpback whales sounding and swimming around. Also some porpoises. We got a berth in the marina and had a great dinner out at the Northern Lights restaurant. There's a great supermarket there, so we did provisioning for the 2 weeks trip to Prince Rupert. Last year we spent several days in Port McNeill with Lynne Werner, so it brought back memories. June 22nd. After topping off fuel and water, we left Port McNeill under calm and sunny skies in the afternoon, and motored to a beautiful little cove, in the Walker Island group. There were several other boats there, which left before us the next day. It's a popular jumping off point to cross Queen Charlotte Strait and pass Cape Caution for boats traveling north. There's also a regular cruise ship parade, several big ships all heading north or south, depending on the day of the week. This day marks the one month mark of cruising. June 23rd. Transiting Queen Charlotte Strait from Walker Island group to Fury Cove 41 mi.. We had light south winds and partly sunny skies and motored all the way. But the good news is, we passed Cape Caution under benign conditions. Cape Caution is open to the ocean and has a shelf (shallow area), so it can be very rough, but not this time. Yay! There were at least 16 other boats anchored. Fury Cove is a delightful protected bay with some white shell beaches. But we didn't have the dinghy inflated yet and it started raining just as we arrived. So we didn't bother trying to get ashore. We even cooked dinner on the stove instead of the bbq. That's 176 nautical miles in a week. We'll post some pictures in the next post.